Linux is now being used in high-energy nuclear studies in Geneva by CERN. 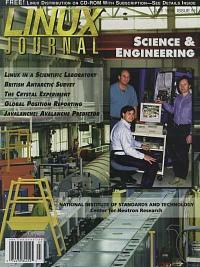 Linux now facilitates scientific research in the Atlantic Ocean and Antarctica. The authors tell us how they use Linux daily to fulfill the requirements of their lab. Although the GPS was originally intended for use by the military, in peace time it has given rise to applications that were heretofore limited to science fiction. This article introduces a prototypical avalanche predicting software package implemented with a Fuzzy Logic algorithm. A report on a data analysis tool currently being developed at CERN. This article gives a quick introduction to the programming language Icon, developed at the University of Arizona. This article explains how linux is used in the ViewSurf “Beach Report”, a fun WebCAM-based service. Here's a good way to protect your files. Mr. Giles explains how to encrypt your entire file system rather than individual files. The Graphical Desktop Korn Shell (DtKsh) is a featured part of the Common Desktop Environment (CDE). DtKsh provides a consistent and reliable graphical Motif shell language that is supported on all CDE-compliant systems. When you need to network your Linux box with Windows, Samba is the way to do it. lex and yacc: Tools Worth Knowing Today, computers can talk and they can listen—but how often do they do what you want? Miscellaneous Character Drivers Mr. Rubini tells us how to register a small device needing a single entry point with the misc driver. The Yorick Programming Language Yorick is an interpreted language for numerical analysis used by scientist on machines from Linux laptops to Cray supercomputers.